Daniel Ricardo Manning was born on 17 May 1966, in Hattiesburg, Mississippi USA, and is a college basketball coach and retired professional basketball player, best known for being the head coach of Wake Forest. During his playing career he won a National Championship with the Jayhawks in 1988, and holds the record for most points in Kansas Basketball history. All of his efforts have helped put his net worth to where it is today. 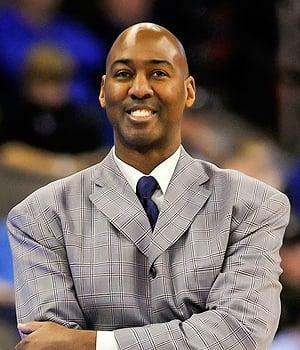 How rich is Danny Manning? As of late-2016, sources estimate a net worth that is at $20 million, mostly earned through a successful career in basketball. He reportedly now earns a $2 million annual salary for his work as a college basketball head coach. As he continues his career it is expected that his wealth will increase. Danny attended Page High School and during his time there, helped the Pirates set a 26-0 record and win a state title, before transferring to Lawrence High School and earning Kansas Player of the Year honors before matriculating. He then went to the University of Kansas, and would become the all-time leading scorer of the school during his senior year. He won the Wooden, Eastman, and Naismith Awards during his college basketball career, and in 1988 he competed in the Summer Olympics with the all-amateur USA national basketball team, winning the bronze medal. Manning then joined the 1988 NBA Draft, and was selected as the first overall pick by the Los Angeles Clippers, the contract that started to increase his net worth. However, he played very few games during his rookie year due to an injury, but would then start to perform well in the 1992 to 1993 season, such that he was selected to become an All Star. In 1994, he was traded to the Atlanta Hawks, but his persistent knee injuries saw him play very few games in the next few years. In 1997, he played with the Phoenix Suns and would win the Sixth Man Award. He was then traded to the Orlando Magic in 1999 and then to the Milwaukee Bucks. He spent his final years playing successively with the Utah Jazz, Dallas Mavericks and Detroit Pistons before retiring in 2003. After retiring, Danny returned to the University of Kansas as the director of student-athlete development, then became the team manager before being promoted to assistant coach by the 2006 season. He became a vital part of the staff of the Jayhawks, and would spend a total of nine years working with the school, also helping his net worth rise. In 2012, he became the head coach of Tulsa and would help the team get to the semifinals of the USA Championship. The Golden Hurricane would continue to perform well in the next year before losing in the second round of the playoffs against UCLA. In 2014, Manning was then hired to become the Wake Forest University head coach, and has been serving there since. For his personal life, it is known that Danny has been married to Julie since 1990; his father is former NBA player Ed Manning, and his daughter would also become a player in the Kansas volleyball team. Danny also holds numerous Hall of Fame inductions mainly for his achievements during his college basketball careers. 1 Hired by Wake Forest University (Winston-Salem, NC) as head coach of the men's basketball team. Manning was 38-29 in two seasons as head coach at the University of Tulsa [April 4, 2014]. 3 1997-98 Sixth Man of the Year for averaging 13.5 Points, 5.6 Rebounds, 2 Assists, 1 Steal and 25.6 Minutes per Game. 4 Member of 1993-1994 NBA Central Division Champion Atlanta Hawks team. Member of 1994-1995 NBA Pacific Division Champion Phoenix Suns team. Member of 2002-2003 NBA Central Division Champion Detroit Pistons team. 5 Forward for the Los Angeles Clippers (1988-1993 and 1994), Atlanta Hawks (1994), Phoenix Suns (1994-1999), Milwaukee Bucks (1999-2000), Utah Jazz (2000-2001), Dallas Mavericks (2001-2002) and Detroit Pistons (2002-2003).